1943. Billy J. Kramer born William Howard Ashton in Bootle, Lancashire. 1965. As The Beatles arrive at Houston Airport in Texas, 5,000 fans break through police lines and rush towards their chartered plane. Luckily, a catering truck is backed up to the aircraft and the boys are ferried to safety. Promoter Bill Weaver said that the security force assembled to ensure the group’s safety was larger than that used by President Johnson when he was in the city. Sell out audiences of 12,000 at each of tonight’s shows will earn The Beatles £ 30,050. The city authories, who own the Coliseum where the concerts are taking place, have demanded a $ 10,000 (£ 3,500) damage bond from the promoter. 1981. Neil Tennant meets Chris Lowe for the first time in an electronics shop in London’s Kings Road. Finding a common interest in dance music, the pair start writing together, eventually forming a duo called West End. That name soon gets dropped in favour of Pet Shop Boys, a name they had jokingly used to refer to some friends who worked in an Ealing pet shop. 1976. Glasgow’s Evening Times runs a headline, “Ramones In Teenage Glue Death Outrage”. The paper claims that the band advocates the habit of sniffing glue. A local member of parliament, James Dempsey, tries to have the band’s first album banned from Scottish stores. 1972. The Midnight Special (NBC, U.S.A.) Pilot show. Host: John Denver. Guests: Argent; Harry Chapin; David Clayton Thomas; ‘Mama’ Cass Elliot; The Everly Brothers; The Isley Brothers. Here’s Argent with “Hold Your Head Up”. 1996. Gospel-rock drummer Steve Marsh (Elim Hall, One Hundred Days) dies of liver cancer, first diagnosed in June. 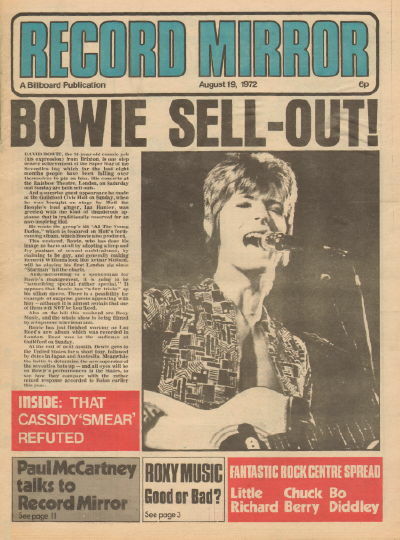 Record Mirror from 19th August 1972. A copy taken from Rockmine’s almost complete run of U.K. music papers from the last 45 years. The first thing I have to do today, is apologize. Somehow, I managed to put today’s blog (i.e. Tuesday 19th August) up in place of yesterday’s. I didn’t realise until late last night and decided to leave it for the morning. So, here I am correcting a rather idiotic mistake.